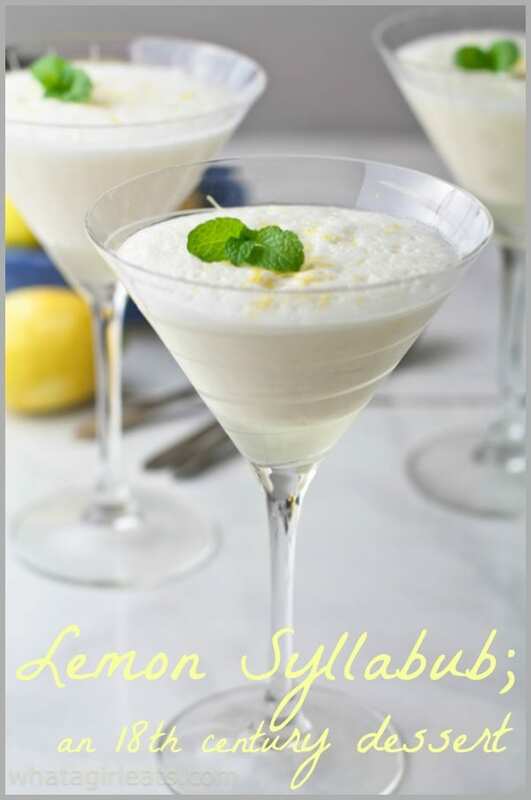 I decided to try the Lemon Syllabub which is a cross between a dessert and a drink, has just 4 ingredients, and is gluten free! As a huge history buff, I was doubtful a cookbook author would be able to do justice to such a weighty subject. I had been in the middle of reading The Founding Foodies: How Washington, Jefferson, and Franklin Revolutionized American Cuisine, which is equally fascinating, when I received Laura’s book. Having seen Hamilton the musical in October, I was excited to learn more about Hamilton the man, I even purchased Alexander Hamilton (the book), for Spencer for our anniversary. The Hamilton Cookbook, not just a cookbook, but a mini-history lesson. I could not have been more wrong. This is not just a cookbook, it’s also includes quite a bit of history as well. Kumin was a lawyer before she began teaching cooking and food history, so she has spent a considerable amount of time researching her subject. If you are at all interested in culinary history, this is book is the perfect addition to your library. Since Hamilton was raised in the West Indies, his food education must have been quite different from that of his peers. He would have been exposed to fruits and vegetables one might not have experienced in the colonies. 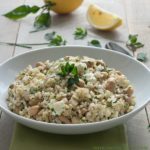 Kumin touches upon that, as well as what cooking during Hamilton’s time would have entailed, and who would have done it. Elaborate meals in simple kitchens. 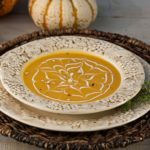 It’s interesting to remember that all the cooking and serving had to be done without the benefit of modern conveniences using rudimentary kitchen tools. Indeed elaborate dinner parties would have been planned and executed on a regular basis. Kumin has included Hamilton’s timeline, menus, diagrams, and excerpts from period cookery books, as well as measurement and temperature conversions, which are a nice addition. 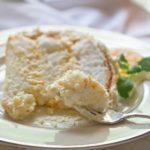 The recipes are organized by courses and include both original and adapted recipes, as many 18th century recipes often use vague amounts. 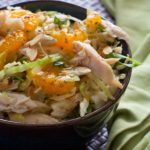 Notes and adaptations are referenced next to each recipe. 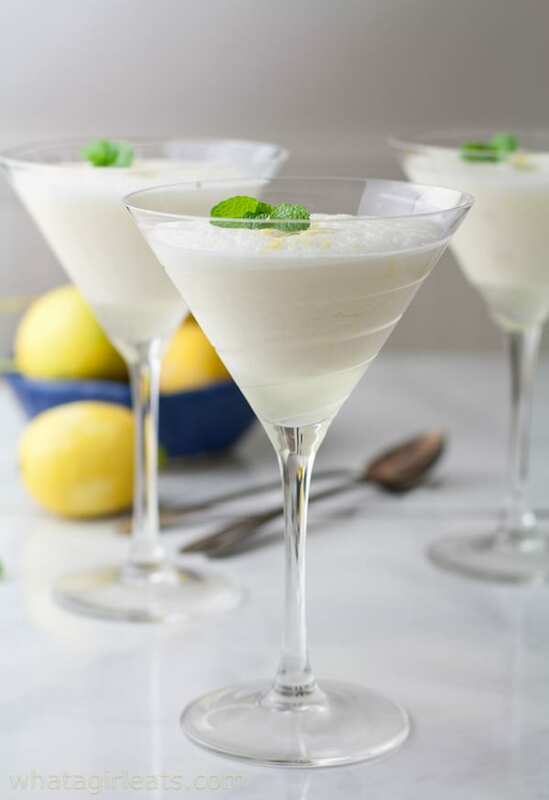 I chose Lemon Syllabub for a couple of reasons, first it reminded me of Lemon Posset, which has been around since Shakespeare’s time and has similar ingredients though the results differ. 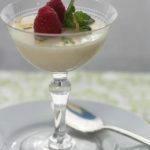 Posset was originally a beverage of sorts, and Syllabub is much the same. 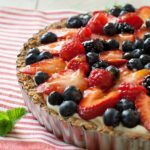 I love the original recipe which faces the adapted recipe. One of the instructions requires a “Chocolate mill to raise a froth” and a “hair sieve” to drain. I have no idea what either of those contraptions is, but thankfully Kumin has teased out the language and given us a simplified version. I chose a sweeter Reisling, as I wanted to to be somewhat sweeter. 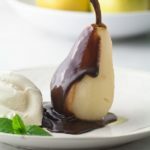 Although this is not an overly sweet dessert/drink. While the recipe serves 2, I did get 3 fairly generous servings, so I believe it would serve 4 in somewhat smaller wine glasses. 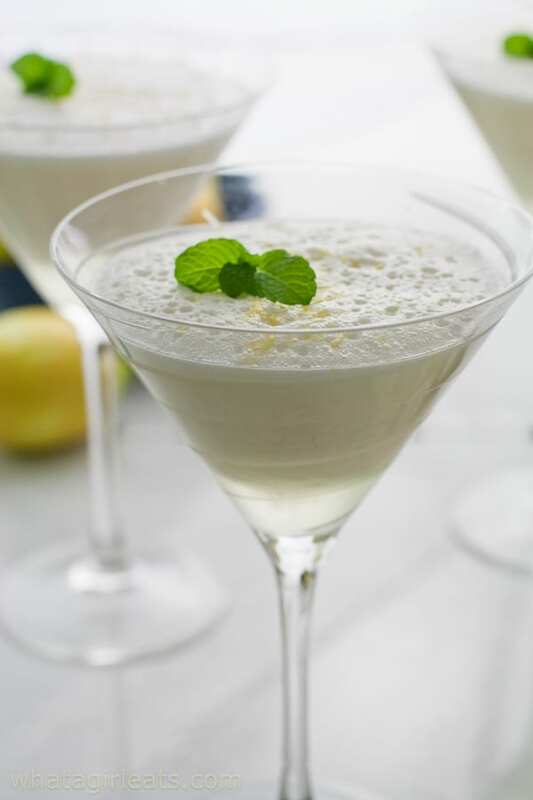 Use a wine or champagne glass as you will want to both spoon and drink syllabub. 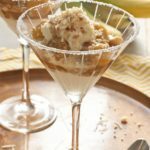 Looking for similar desserts? 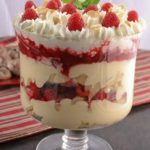 How about Lemon Bars or Strawberry Fool? 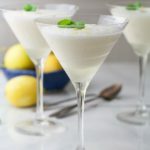 An 18th century dessert/drink from "The Hamilton Cookbook", by Laura Kumin, Lemon Syllabub is just 4 ingredients an takes just a few minutes to make. 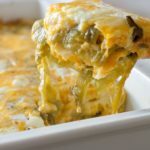 Allow several hours before serving, so as to allow the layers to separate. Serves 2-4 depending on the size of the glass. 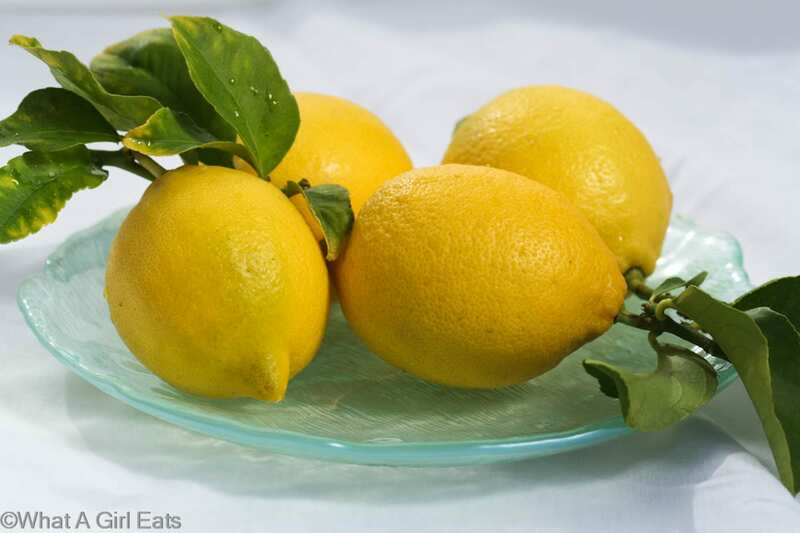 1 lemon, cut in half, with rind grated from half, and juice from one or both halves for a total of 1/4 cup juice. Rub the grated lemon rind (zest), into the sugar with your fingers until they are well combined. Mix the rind (zest), sugar, lemon juice and wine together in a medium sized bowl. Add the cream and whisk the mixture until it froths. Gently pour into wine, champagne or martini glasses. (Amount will depend on how large your glasses are). Let the glasses sit on the counter for about 2 hours, then refrigerate until serving. As the glasses sit, the froth will rise, leaving the lemony wine on the bottom of the glasses. 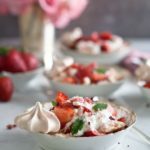 I have this recipe in one or more of my British cookbooks, but have never made it. I think I’d love it, though! The Hamilton cookbook would be just my cup of tea, too! Two things I love together: cooking and history! It was super simple! I love the history of cooking! Well, first it’s gorgeous. And, it sounds delicious! What a wonderful post! I’m not enough of a history buff to purchase this book, but it is a truly fascinating concept!